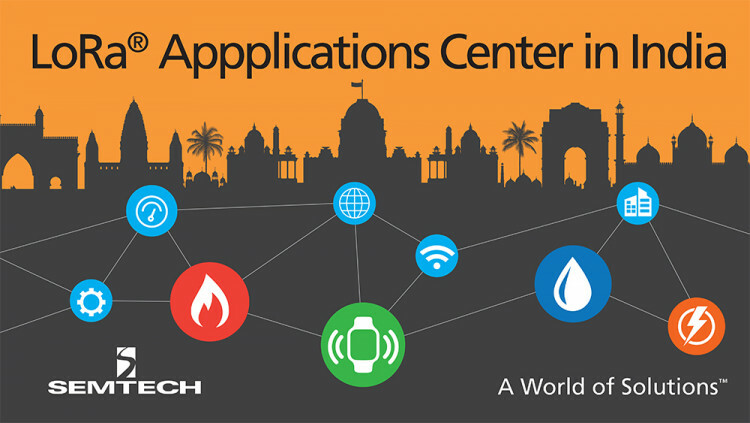 Semtech Corporation (Nasdaq: SMTC), a leading supplier of analog and mixed-signal semiconductors, and Tata Communications, a leading provider of A New World of Communications™, are set to launch the first applications center dedicated to LoRa® Technology in Mumbai, India. The center allows enterprise customers and Internet of Things (IoT) solution providers to deploy and test their applications over a LoRaWAN™-based low power, wide area network (LPWAN). Following successful LoRaWAN network trials in Mumbai, Delhi and Bengaluru, Tata Communications and Semtech have worked together to deploy 35 IoT proofs-of-concept (PoCs) based on LoRa Technology across these cities. The PoCs cover a wide array of applications, including sensors for remotely monitoring air conditioners and safety deposit boxes, energy management systems used to optimize the use of electricity, gas and water, and multiple smart buildings and smart city applications. Semtech is a member of the LoRa Alliance, a group of more than 400 companies committed to driving and enhancing the LoRaWAN specification to ensure interoperability and scalability of LPWANs and IoT applications. Through its work with member companies and IoT industry groups, the LoRa Alliance is making LoRaWAN the standard for LPWANs focused on low-power, long-range IoT applications. To date, there are LoRaWAN public and private networks in more than 50 countries worldwide. Low Power: The LoRaWAN protocol was developed specifically for low power and enables unprecedented battery lifetime of up to 20 years depending on the application. Open Standard: The LoRaWAN protocol ensures interoperability among applications, IoT solution providers and telecom operators to speed up adoption and deployment. To learn how LoRa enables IoT visit Semtech’s LoRa/IoT site. Engage with the LoRa Community or contact Semtech’s support team for technical support or general product inquiries. Tata Communications Limited (CIN no: L64200MH1986PLC039266) along with its subsidiaries (Tata Communications) is a leading global provider of A New World of Communications™. With a leadership position in emerging markets, Tata Communications leverages its advanced solutions capabilities and domain expertise across its global network to deliver managed solutions to multi-national enterprises and communications service providers. The Tata Communications global network includes one of the most advanced and largest submarine cable networks and a Tier-1 IP network with connectivity to more than 240 countries and territories across 400 PoPs, as well as nearly 1 million square feet of data centre and colocation space worldwide. Tata Communications’ depth and breadth of reach in emerging markets includes leadership in Indian enterprise data services and leadership in global international voice communications. Tata Communications Limited is listed on the Bombay Stock Exchange and the National Stock Exchange of India. All statements contained herein that are not statements of historical fact, including statements that use the words “to launch,” “to deploy,” “plans to,” “aims to,” “believe,” “goal is to,” “”or other similar words or expressions, that describe Semtech Corporation’s or its management’s future plans, objectives or goals are “forward-looking statements” and are made pursuant to the Safe-Harbor provisions of the Private Securities Litigation Reform Act of 1995, as amended. Such forward-looking statements involve known and unknown risks, uncertainties and other factors that could cause the actual results of Semtech Corporation to be materially different from the historical results and/or from any future results or outcomes expressed or implied by such forward-looking statements. Such factors are further addressed in Semtech Corporation’s annual and quarterly reports, and in other documents or reports, filed with the Securities and Exchange Commission (www.sec.gov) including, without limitation, information under the captions “Management's Discussion and Analysis of Financial Condition and Results of Operations” and “Risk Factors”. Semtech Corporation assumes no obligation to update any forward-looking statements in order to reflect events or circumstances that may arise after the date of this release, except as required by law. Semtech, the Semtech logo, LoRa and LoRaWAN are trademarks or service marks of Semtech Corporation and/or its affiliates. TATA COMMUNICATIONS and TATA are trademarks of Tata Sons Limited in certain countries. Third-party trademarks or service marks mentioned herein are the property of their respective owners.